Thunder Bay Press, 9781684122806, 328pp. With Anatomy 360, you'll get a complete picture of every part of your body—from your head to your toes, inside and out, and from every angle. Our bodies are a mystery to us. We see our arms and legs move, but may have no idea how the muscles beneath look as they contract. We know that our stomachs digest food and our hearts pump blood, but the images we have in our heads of these organs are often inaccurate or incomplete. Even seeing pictures of our internal systems and organs can be misleading if these pictures don't offer a full, 360-degree view. 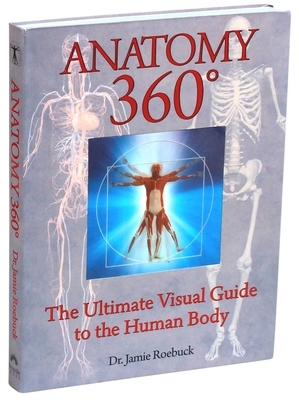 This new flexibound edition of Anatomy 360 shows the human body in its entirety—from the skin to the muscles to the organs to the bones. This stunning book provides a unique perspective on our most crucial parts, showing how the structures of our bodies influence their functions. You'll learn about the vagus nerve, which allows us to swallow, speak, and cough, and the frontalis muscle, which raises our eyebrows when we're surprised. You'll also learn why our noses run when we cry and why our brains are so important even though they weigh just one kilogram each. With Anatomy 360, you'll finally get a complete look at the human body—even the parts you thought you'd never see! Dr. Jamie Roebuck is a lecturer in anatomy and physiology in the Clinical Education Department at the University of Warwick, England.